Location only. If it wasn't for the star beach resort facilities across the road, we would have left immediately. Didn'T like anything else about this place. The apartment was well furnished and clean. The owners were extremely kind. Recommend to have dinner at their restaurant! This review was based on my fathers experience.I would add that I requested by email ,notification that my father had arrived safely,as he is elderly and was travelling alone.This was done in good time.My thanks to Giannis and family -well done! Couldent have been made more welcome. Have stayed here before and i will always go back . 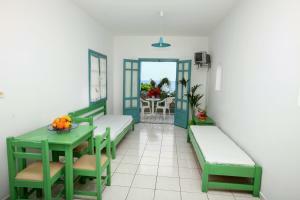 solo traveller , i felt safe and comfortable , Relaxed atmosphere , great for a rest . Handy for the beach /all other amenities close by . 1. 30 мин от аэропорта до отеля, можно доехать на такси, рейсовом автобусе (остановка прямо у аэропорта), взять в аренду машину. 2. Отель находится в 3 минутах от хорошего песчаного пляжа, с лежаками, зонтиками ( за дополнительную плату), мы не пользовались лежаками, т.к. с маленьким ребенком не полежишь. Вход в море песчаный. Хорошая глубина, подойдет всем. Т.к. были с 25.09 по 12.10 было много пасмурных дней, сильный ветер, были волны ощутимые. 3. Пляж находится на территории Star Beach, где можно бесплатно пользоваться детскими бассейнами, площадками, есть чем развлечь ребенка от 1г до 7 лет. 4. Рядом с отелем автобусная остановка, супермаркет Спар. 5. Сам отель простой, но уютный, персонал приветливый, хозяева очень радушные. 6. Уборка была часто, приползают муравьи, т.к. берите средства от них с собой. 7. У нас был номер с одной спальней, с видом на море. 2 больших балкона. 8. На территории есть таверна, где всегда рады вкусно накормить. Lock in a great price for Anatoli Apartments – rated 8.2 by recent guests! 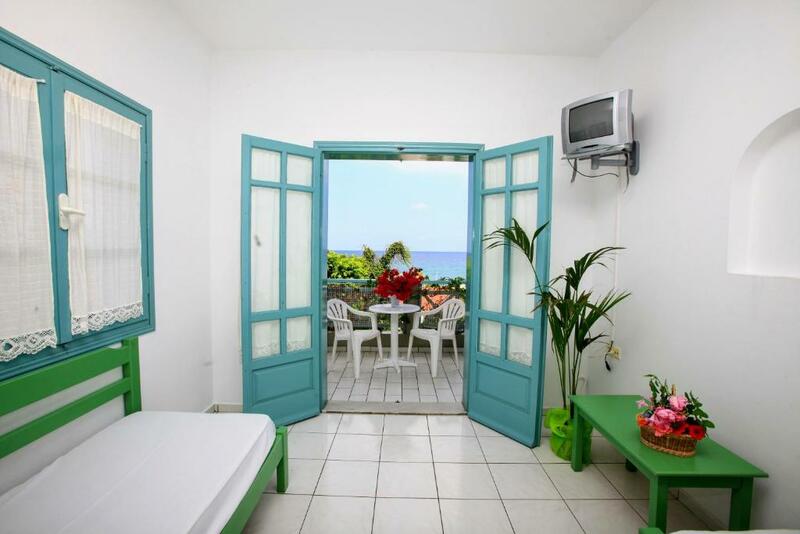 Featuring a pool with terrace and a restaurant serving traditional dishes, Anatoli Apartments is in Hersonissos of Heraklion, just 50 feet from the sandy beach. It offers accommodations with cooking facilities and a balcony or a patio surrounded by a lush garden. 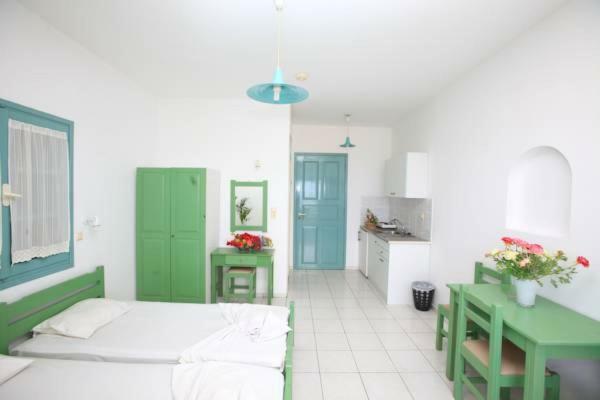 Offering views of the Cretan Sea, the pool or the garden, the studios and apartments of Anatoli are traditionally decorated with wood furnishings in green colors. Each unit comes with a kitchenette with fridge, stove and coffee maker. A dining area and a private bathroom are also featured. Continental breakfast is served daily at the snack bar by the pool, where guests can also enjoy a variety of drinks and light snacks throughout the day. The on-site restaurant offers Cretan flavors cooked at a wood-fired oven. Anatoli Apartments is 17 miles from Heraklion City and Port and 14 miles from Nikos Kazantzkis International Airport. The village of Stalis is 3 miles away. Free Wi-Fi is available in the public areas and free public parking is available nearby. 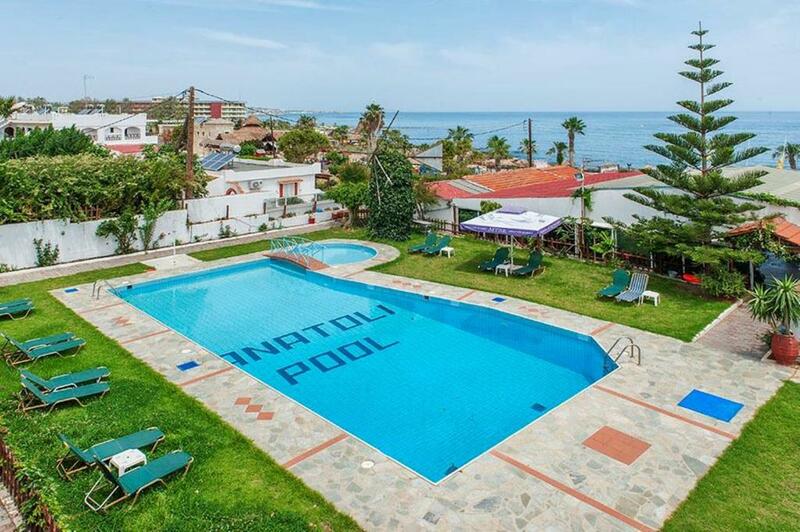 When would you like to stay at Anatoli Apartments? 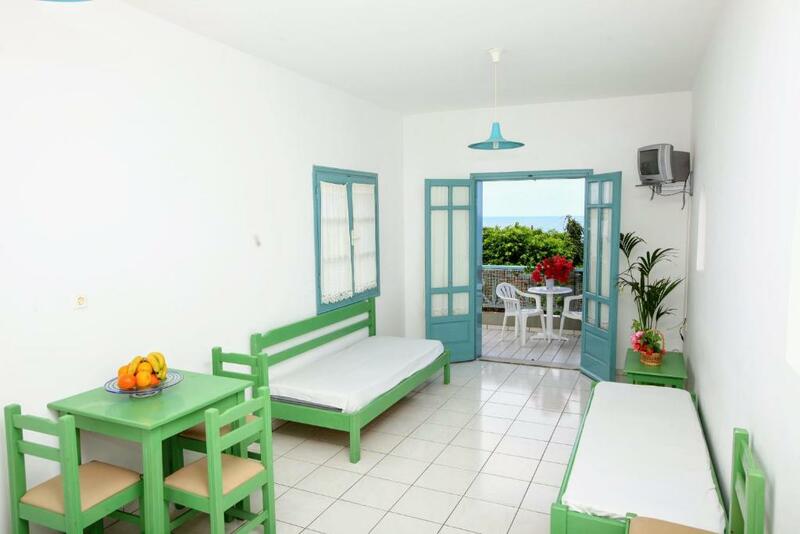 Just 66 feet from Hersonissos Beach, this traditionally decorated studio opens out to a balcony or patio enjoying views over the garden. It includes a kitchenette with dining area. Divided in 2 levels, this traditionally decorated studio lies within 66 feet from Hersonissos Beach. It opens out to a balcony or patio overlooking the garden. 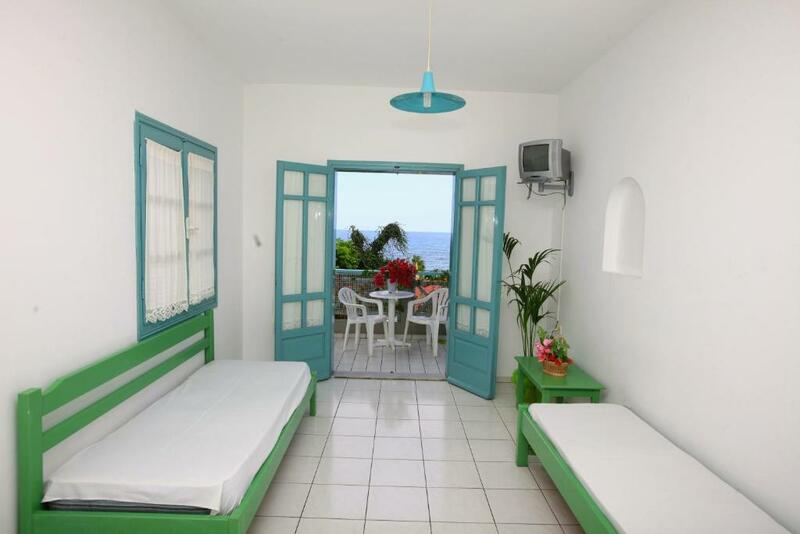 Just 66 feet from Hersonissos Beach, this traditionally decorated apartment consists of a separate bedroom and a bedroom with kitchenette and dining area. It opens out to a balcony overlooking the pool or the garden. 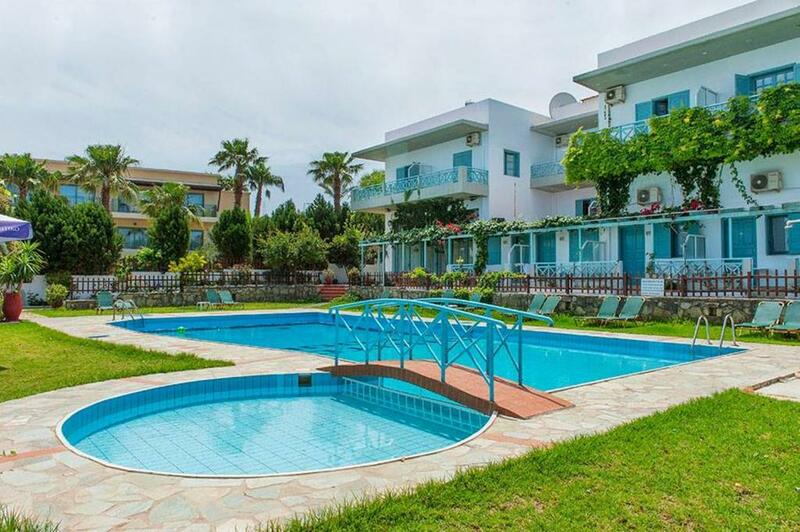 Just 66 feet from Hersonissos Beach, this traditionally decorated studio opens out to a balcony or patio enjoying views over the Cretan Sea, the pool or the garden. It includes a kitchenette with dining area. Apartments is situated only 80 meters away from the nearest sandy beach, in the outskirts of the lively center of Hersonissos. Located far from the hassle and noises of the entertainment city center but yet close to visit, with good choices for food and entertainment, it is a small family run complex that offers comfortable accommodation and friendly services. Efi and the management will be next to you for any help you might need regarding your stay. Located 27 km away from Kazantzakis International Airport and 29 k.m of Heraklion port. The cosmopolitan resort of Hersonissos is 300 meters away with plenty of sandy beaches and excellent choices for swimming and shopping. House Rules Anatoli Apartments takes special requests – add in the next step! Anatoli Apartments accepts these cards and reserves the right to temporarily hold an amount prior to arrival. -for stays from the 16th of October, breakfast is served in the room. Please inform Anatoli Apartments of your expected arrival time in advance. You can use the Special Requests box when booking, or contact the property directly using the contact details in your confirmation. Place is very outdated. Beds were like rock with no matress covers. Matresses stained and dirty. We did get two single foam toppers for a double bed when we asked after two sleepless and painful nights. The pool was dirty brown when we arrived which they cleaned the following day, but we did not have confidence to use it after seeing original condition. No privacy as the apartments directly overlook each other. Any complaint was met with disdain and excuses. More effort to consider their guests comfort from this family run establishment would go a long way. The tolete not be clean for the 6 night I was there , very small and old horrible. Information said there was a restaurant and entertainment. Everything was closed when we got there. It should have made it clear that these were not available for our holiday dates. The TV didn't work but we didn't miss it, so didn't ask to have it fixed. Other guests may not be happy with that. Helpful, friendly staff, good location. Clean. I am really sorry about my following comments but my general opinion is that the hotel in total was awful. Firstly, the actual hotel is really different compared to website photos. My first thoughts when I arrived in the hotel was that I was in the wrong place. The swimming pool was dirty, the windows were broken, the toilet was really old and finally the room had a really bad smell like the windows were closed for months. Finally the service of the hotel except the cleaner lady who was wonderful ,was really problematic. Especially the Manager of the hotel was really rude, full of irony , and sarcastic everytime I had a request. The room had a decent air contintion.